(Seychelles News Agency) - Luxury property Seychelles-based developer Eden Island Development Company (EIDC) said on Thursday that in January it sold homes worth $12 million. EIDC, which built apartments and villas on a reclaimed island in Seychelles, also clinched three prestigious international property awards at a recent ceremony in Dubai, its marketing director Peter Smith told reporters. Eden Island was named as the Best Development: Multiple Units in Seychelles and also Best Development Multiple Units for Africa as a whole at the recent International Property Awards, Arabia and Africa 2013/4 event. It was also awarded the Highly Commended accolade in the Development Marketing category. “Both the sales volumes and the awards confirm we are offering an exceptional product,” he said. The estate has 580 housing units, 460 of which have been sold, and Smith said the remaining 120 will soon be bought judging by current levels of demand. Many of the owners continue to upgrade or buy second, third or more properties in the development. “This is a really positive endorsement from the very people who have already invested,” said Smith. “In fact some 25% of the new homes on Eden Island are owned by homeowners who have upgraded or bought second or more properties,” he noted. 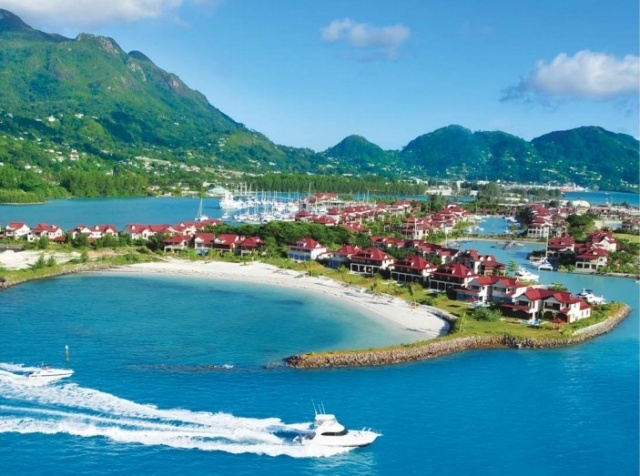 Contractors on site told Seychelles News Agency reporters that the properties conform to the Creole architectural style of the area, with large verandas, high-pitched red roofs and simple lines. At the Dubai ceremony, Eden Island was commended for its careful attention based on its research into geotechnical, marine, architecture and into its target markets. The event’s organisers applauded the island’s high standard of landscaping noting that developer cultivated in its own nursery all the plants now flourishing all over Eden Island. Eden Island Development Company is owned by group of shareholders, held through offshore structures representing the interests of South African and Austrian investors.